Stunning Coastline As Far As the Eye Can See! 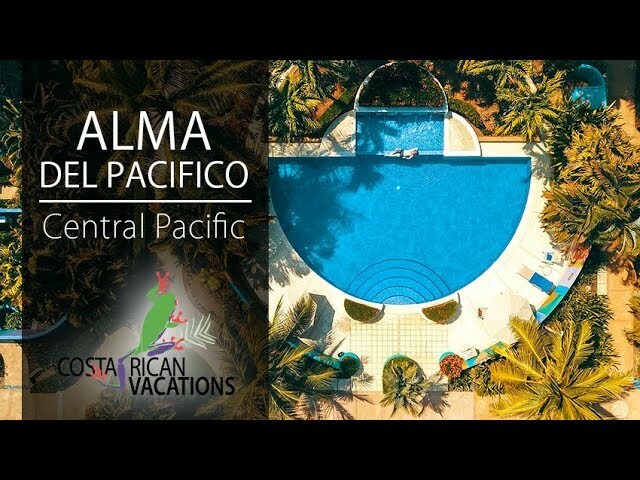 Alma del Pacifico Hotel, located along the sweeping Playa Esterillos Este beach between Jaco and Manuel Antonio, offers beachfront villas featuring unique, vibrant architecture and art and top-notch hospitality and amenities. Only two hours from San Jose, this 4-star hotel is the ultimate seaside escape. The 20 spacious private villas all feature a large terrace from which you can enjoy panoramic views of the Pacific Ocean or lush tropical gardens. Each villa has private walled gardens, a sitting area, mini-bar, air conditioning plus fan, TV, and more. The generously sized bathrooms feature a mosaic tile shower that opens to an intimate, private garden. There is an array of wonderful on-site amenities including a lovely gift shop, two 24-hour pools and a Jacuzzi, and room service. The spa offers many therapies and uses organic, local ingredients; you can even opt for a massage right on the beach! Enjoy the beautiful local flora which attract animals like butterflies, iguanas, and even endangered scarlet macaws as you walk the paths of the property. Savor a healthy, gourmet international or Costa Rican dish from the open-air, thatched roof pavilion restaurant and bar where every table offers a stunning view of the beach and gardens. Cuisine emphasizes fresh seafood and produce along with many fruits, vegetables, and herbs grown in the hotel’s own gardens. There is WiFi throughout the property and a continental breakfast is included in your stay.